What do ION’s Criminal Minds and House have in common? Both shows are “Positively Entertaining” to men and women. ION is a cable television network started by ION Media Networks in 2008. A top 15-rated entertainment network among adults 25-54, ION is the only entertainment network with double-digit growth three years in a row. ION is the leading network in adult co-viewing. The network reaches 260 million Americans in 100 million U.S. households and is known for shows such as NUMB3RS, Flashpoint, and Cold Case. ION Network was searching for a fun and engaging way to explain their core demographic to their trade audience. 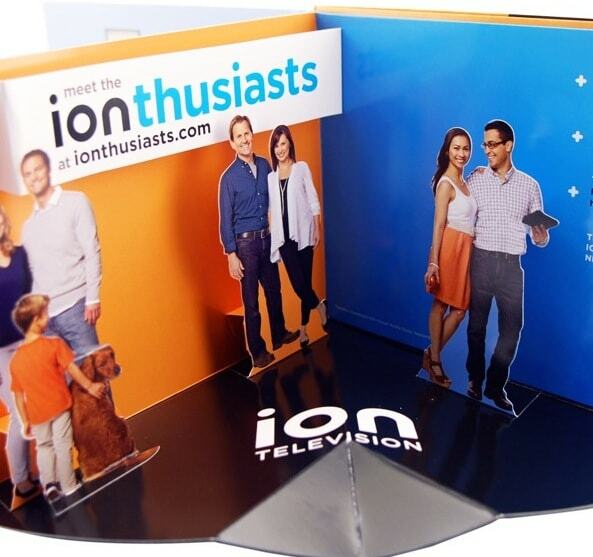 ION Network partnered with Americhip to create an ION pop up book. Using Americhip's paper engineering skills, they made each room of the house come to life which represented each core demographic. This was poly bagged with Ad Age. ION received rave reviews and plans to use this type of execution again. Gone are the days of flat advertising. Americhip's talented team of globally-recognized paper engineers is ready to help you create an imaginative and intricate paper pop up card or book. From a creative point of view, our patented paper technologies are truly ground breaking and awe-inspiring. We offer edgy print collateral solutions that range from classic, ready-to-go pop-ups to elaborate and complex custom designs that unfold and rise from the page for impressive WOW effects. A dimensional print creation gives your advertising pleasing and unexpected originality. It’s true, pop ups grab and keep attention - no matter what age group - giving your advertisement the opportunity and edge to communicate your message to customers.